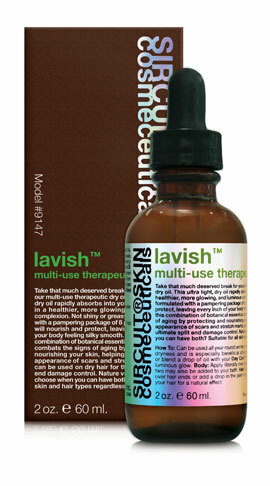 Take that much deserved break for yourself with Lavish™, our multi-use therapeutic dry oil. This ultra-light, dry oil, formulated with a pampering package of 9 precious oils that’s sure to leave every inch of your body feeling silky smooth and soft! Not shiny or greasy, this unique combination of intoxicating botanical essential oils collectively helps to combat the visible signs of aging by helping to minimize the appearance of minor imperfections, thus promoting a more glowing and luminous complexion. It can also be used on dry hair for the ultimate in split-end damage control. Nature vs. Nurture. Why choose when you can have both? 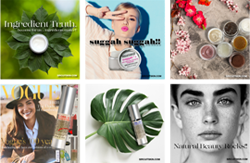 There's a new way to feel beautiful! Hydrates dry, parched skin leaving no oily residue. As pre-cleansing oil, gently removes impurities and make-up from skin. Smoothes split ends and helps restore vitality to damaged hair. Reduces the appearance of minor imperfections. How To: Can be used all year round (winter or summer) to combat environmental dryness and is especially beneficial after sunbathing. Face: Apply to face or blend a drop of oil with your Day Care™+ moisturizer (or foundation) for a luminous glow. Body: Apply liberally over arms and legs as needed. A drop or two may also be added to your bath. Hair: Use as a mask for dry hair, smooth over hair ends or add a drop in the palm of your hand and gently run through your hair for a natural effect. Kukui Nut Oil: Excellent source of Gamma Linoleic Acid that helps to keep skin feeling soft and smooth while enhancing the overall level of hydration and appearance. Arctic Cranberry Oil: Provides essential fatty acids for moisturizing benefits and tocotrienols to help defend the skin against harmful free radicals. Cloudberry Seed Oil: A unique combination of energy and nutrition that’s rich in skin’s essential Linoleic and Alpha-Linolenic acids and protecting carotenoids. Bitter Almond Oil: Provides high levels of Oleic Acid and unsaturated triglycerides delivering intense moisture to the skin, helping to increase the softness and smoothness of the skin. Calophyllum Inophyllum Oil: This luxurious oil has been used for centuries to help to minimize imperfections and is known for its many anti-aging benefits that promote the appearance of younger, smoother looking skin. Formulated With: Vitis Vinifera (Grape) Seed Oil, Aleurites Moluccana Seed Oil, Borago Officinalis Seed Oil*, Oxycoccus Palustris (Arctic Cranberry) Seed Oil, Rubus Chamaemorus (Cloudberry) Seed Oil, Prunus Amygdalus Amara (Bitter Almond) Kernel Oil, Macadamia Ternifolia Seed Oil, Calophyllum Inophyllum Seed Oil, Melia Azadirachta (Neem) Seed Oil, Tocopheryl Acetate (D-alpha) *USDA Certified Organic | NOP. Phthalate-free.